Abu Zubaydah, a man once called al-Qaeda’s “chief of operations” appears to be at the center of an unraveling of the official myth behind al Qaeda. After his capture in early 2002, Zubaydah was the first “detainee” known to be tortured. The information allegedly obtained from his torture played a large part in the creation of the official account of 9/11 and in the justification for the continued use of such torture techniques. Yet in September, 2009, the U.S. government admitted that Zubaydah was never a member or associate of al Qaeda at all. These facts raise an alarming number of questions about the veracity of our knowledge about al Qaeda, and the true identity of the people who are said to be behind the 9/11 attacks. Unlike other alleged al Qaeda leaders, including Khlaid Sheik Mohammed and Rasmi bin Alshibh, Zubaydah has never been charged with a crime. As these other leading suspects await their continually-postponed military trial, Zubaydah is instead being airbrushed out of history. Why would the U.S. government want us to forget Zubaydah, the first and most important al Qaeda operative captured after 9/11? The 9/11 Commission called Zubaydah an “Al Qaeda associate,” a “long-time ally of Bin Ladin,” a “Bin Ladin lieutenant,” and an “al Qaeda lieutenant.” The Commission’s claims were somewhat contradictory in that Zubaydah was, in the Commission’s report, represented as both an al Qaeda leader and simply a terrorist colleague who collaborated in the training and recruiting of operatives. For example, the Commission reported that Zubaydah “helped operate a popular terrorist training camp near the border with Pakistan” [Khalden Camp], and that Bin Laden had an agreement with Zubaydah to “conduct reciprocal recruiting efforts whereby promising trainees at the camps would be invited to join al Qaeda.” It was unclear why a “Bin Laden lieutenant” would need such a reciprocal agreement with Bin Laden. …the Government has not contended in this proceeding that Petitioner [Zubaydah] was a member of al-Qaida or otherwise formally identified with al-Qaida. Respondent [The United States Government] does not contend that Petitioner was a “member” of al-Qaida in the sense of having sworn a bayat (allegiance) or having otherwise satisfied any formal criteria that either Petitioner or al-Qaida may have considered necessary for inclusion in al-Qaida. Nor is the Government detaining Petitioner based on any allegation that Petitioner views himself as part of al-Qaida as a matter of subjective personal conscience, ideology, or worldview. The Government has not contended in this proceeding that Petitioner had any direct role in or advance knowledge of the terrorist attacks of September 11, 2001. … the Government has not contended that Petitioner had any personal involvement in planning or executing either the 1998 embassy bombings… or the attacks on September 11, 2001. Obviously this attempt to remove a key 9/11 accomplice from history must make a significant difference to the official account of 9/11. We would expect that major revisions to the 9/11 Commission Report would be necessary given the knowledge that the man never had a connection to al Qaeda. When Zubaydah was captured, in March 2002, U.S. government officials touted him as the biggest catch of the War on Terror, at least until the capture of Khalid Sheik Mohammed (KSM). 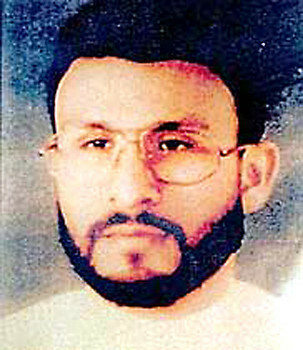 FBI Director Robert Mueller stated that Zubaydah’s capture would help deter future attacks. White House spokesman Ari Fleischer said that Zubaydah could provide a treasure-trove of information about al-Qaeda. Secretary of Defense Donald Rumsfeld claimed that Zubaydah was “a man who knows of additional attacks”, who has “trained people to do this”, and was a big fish who had a fountain of knowledge. “extremely dangerous” and a planner of 9/11. – State Department legal advisor John B. Bellinger III in a June 2007 briefing. the fourth ranking member of al Qaeda behind Bin Laden, Ayman al-Zawahiri, and Muhamed Atef. a colleague of Richard Reid, the shoe-bomber. one of bin Laden’s top planners of terrorist operations who knew of al Qaeda plots and cells. the source of information that UAL Flight 93 was intended to hit the White House. Because we now know that Zubayda was never an al Qaeda operative, or even an al Qaeda associate, we are forced into the stunning realization that all of this was false. The questions that should arise from that realization include: How much of what we know about al Qaeda, and how much of the War on Terror, was built on the torture testimony of a man who clearly could not have known anything about al Qaeda at all? But as we know now, the CIA reportedly told Abu Zubaydah during his interrogation that they discovered he was not an al-Qaeda fighter, partner, or even a member. Still, KSM and Bin Alshibh were caught and tortured too. The 9/11 Commission Report was largely based on third-hand accounts of what these tortured detainees said, with “two of the three parties in the communication being government employees.” The Commission itself wrote that “Chapters 5 and 7 rely heavily on information obtained from captured al Qaeda members.” The truth is, however, that more than half of the 9/11 Commission Report is based on completely unreliable torture testimony to which the Commission had absolutely no access – not even through interviews with the interrogators. KSM’s torture is referred to 221 times in the report, and that of Bin Alshibh is referred to 73 times. The Commission used one or more of these “interrogations” as its source a total of 441 times in its report footnotes. The torture of Zubaydah was specifically used to support claims about Bin Laden’s plans and actions, al Qaeda’s policies, the recruitment of the hijackers and other al Qaeda operatives, and details about the leaders who planned 9/11. According to author Jane Meyer, CIA agent John Kiriakou said “Zubaydah openly admitted his role in the September 11 attacks and claimed to regret having killed so many Americans.” Apparently, the 9/11 Commission didn’t think this latter claim to be credible although it promoted other dubious information supposedly generated by the torture of these suspects. Given the apparent “mistakes” related to Zubaydah being represented as an al Qaeda leader, there appears to be some serious revision required in the official account of 9/11. However, realistically, at this late date the information attributed to Zubaydah cannot likely be untangled from the official myth behind the War on Terror and the associated actions of the U.S. government. That’s because the torture of Zubaydah was used in support of unprecedented policy changes and actions. President Bush personally used the perceived value of Zubaydah’s capture and torture to justify the use of the CIA’s torture techniques as well as the detention of suspects in secret CIA prisons around the world. The U.S. government used the questionable intelligence obtained from Zubaydah in order to justify the invasion of Iraq. Officials stated that the allegations that Iraq and al-Qaeda were linked through training people on the use of chemical weapons came from Zubaydah. There was no independent verification of these claims. Zubaydah’s torture testimony was also used to justify the use of military tribunals, moving the trial of alleged al Qaeda suspects out of the open civil courts. President Bush asked Congress in a speech in September 2006 to formulate special rules in order to try Abu Zubaydah via military commission in Guantanamo Bay. In fact, in late April 2002 less than one month after Abu Zubaydah’s capture, Justice Department officials stated Abu Zubaydah “is a near-ideal candidate for a tribunal trial.” Ironically, Zubaydah may be the only leading suspect to never face trial. In addition to justifying the use of illegal torture techniques, the Bush administration used Zubaydah’s capture as justification to accelerate its domestic spying program. The claim was that it would allow quick action on the phone numbers and addresses seized during Zubaydah’s capture. “U.S. officials have said that Abu Zubaida was a senior al-Qaeda terrorist. They claimed that he was the ‘No. 3 man’ in al-Qaeda, its chief of operations, who worked directly with Osama bin Laden. They said that he was personally involved in the Sept. 11, 2001, attacks and every other major al-Qaeda operation and knew the details of future attack plans. Now that the US government has admitted that it has no case against Abu Zubaydah and that he was never associated with al Qaeda, will they release him? As attorney Mickum requested, will his client be allowed to tell his own story? More importantly, will the official accounts of 9/11 be reviewed to extricate claims allegedly made by and about Zubayda so that those false claims do not to provide additional false direction in War on Terror? As with the court order to classify “any statements made by the accused” in the trials of KSM and other suspects, if this man is allowed to speak we may find that his mind has not been completely obliterated through the torture we inflicted upon him. And we may find that the official myth of 9/11 and al Qaeda will not hold up against the open and un-tortured testimony of the people alleged to have committed the crimes of 9/11. In the end, it seems that the Zubaydah case is a threat to al Qaeda itself as well as a public admission that some lies must be kept under wraps in order to maintain the overall deception that supports the War on Terror. Zayn al Abidin Muhammad Husayn v. Robert Gates, Respondents Memorandum of Points and Authorities in Opposition to Petitioner’s Motion for Discover and Petitioner’s Motion for Sanctions. Civil Action No. 08-cv-1360 (RWR), September 2009. The 9/11 Commission Report sourced eleven of its claims to the torture of Zubaydah: footnotes 18, 43 and 75 in chapter 2, footnotes 19, 31, 35 and 106 in chapter 5, footnotes 8 and 125 in chapter 6, and footnotes 90 and 108 in chapter 7.
where is the outrage? Where is the justice? Where are the authorities, the administration, the Attorney General, etc. etc. etc. who have the legal power to do the right thing here and now? Do they even want to get to the truth? Do they want to keep covering up this apparent abortion of justice? We better all care and speak out! Hopefully we the people care! Any answers? Thinker on Mon, 10/15/2012 - 10:51pm.